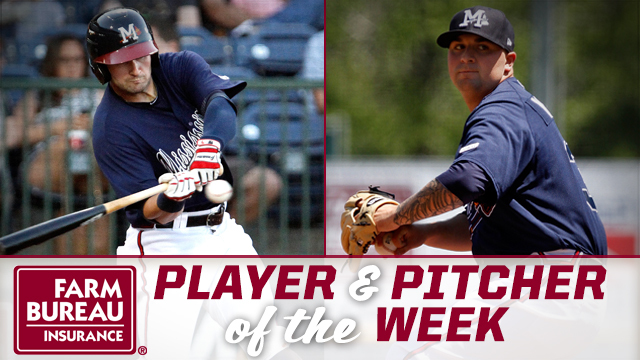 PEARL, MS -- Outfielder Matt Lipka and RHP Rob Whalen have been named Mississippi Farm Bureau Player and Pitcher of the Week for the week ending Sunday, May 15. Lipka, 24, posted a .333 average with a double and two RBI in six games this week. In 36 contests this season, Lipka is hitting .254 with 11 extra-base hits and nine RBI. He spent last season at Double-A Mississippi after missing most of 2013 with an injury. In 119 games last season, he posted a .246 average with 45 runs, 26 RBI and 16 stolen bases. Lipka was selected by the Braves in the supplemental round of the 2010 draft out of McKinney High School (TX). Whalen, 22, picked up the win after holding the BayBears to just one earned run on four hits through six innings last Thursday. The right-hander is 2-3 with a 3.47 ERA in seven starts for the M-Braves this season. Opponents are hitting .214 against Whalen. He was acquired by the Braves along with RHP John Gant from the New York Mets in exchange for Kelly Johnson, Juan Uribe and cash on July 24, 2015.